Why is Demerol addiction treatment important? Firstly, Demerol addiction treatment is important because it’s a potent opiate that is highly addictive and can be lethal. Even when a doctor prescribes it, using Demerol can lead to addiction. Unfortunately, many young people abuse the drug, and many use it for fun. As a consequence, prescription drug abuse are becoming one of the worst “epidemics” worldwide. What does Demerol recovery process include? Generally speaking, the recovery process from Demerol addiction includes detox and aftercare. Dealing with physical withdrawal is crucial as pain and anxiety can lead to a relapse. Therefore, they highly recommend lowering the dose, substitute medications, and staying in a residential facility. Furthermore, one should pair detox should with emotional and peer support and behavioral therapy. Aftercare and resocialization are crucial. 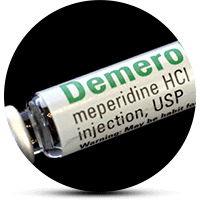 First and foremost, Demerol is a powerful and widely used opioid painkiller. When we hear the word ‘narcotic,’ the first picture that comes to mind is a homeless and toothless person. He is looking for a used needle to inject that scary heroin. Each drug contains some connotations. Moreover, many rave ‘vets’ carry the memories and results of their favorite drugs. Let’s be honest, though. Addiction is not caused only by illicit drugs. Actually, one of the worst drug epidemics in the U.S. is caused by prescription drugs. In fact, it stated by the Centers for Disease Control and Prevention (CDC). Each year, more and more people get addicted to prescription drugs, mainly painkillers. Additionally, Demerol falls in the same category, resulting in many cases of addiction and overdose. This drug, even when a doctor prescribes it, can cause addiction. Especially, when they use it at high doses or for the long-term treatment of chronic or acute pain. Demerol is highly addictive. Severe withdrawal symptoms can come with the quitting of the drug, such as body aches, tremors, insomnia, and paranoia. In any case, they divide the recovery process into two phases: detox and psychological counseling. It comes with a particular focus on aftercare. Going cold turkey is one of the options when it comes to detox. However, lowering the dosage can be safer and more comfortable. Sometimes, substitutions, such as with Suboxone, can be provided to cope with withdrawal. Additionally, vitamins and other foods can also become an important part of treatment and recovery. In some cases, they can give Benzos to treat anxiety and seizures. They should motivate the addicted individuals to look inside. As a result, they might find all the problems that they might be experiencing. Therefore, they recommend behavioral therapies because they provide structure to people’s lives. Incidentally, 12-step programs, can help if they have the support of friends. Furthermore, aftercare is also crucial. The patient often needs family therapy to restore the warm home environment. They should also provide career advice. Treatment of co-morbid disorders is important because according to data provided by the Substance Abuse and Mental Health Services Administration (SAMHSA). Only in 2014, approximately 8 million US citizens suffered from an addiction parallel to another mental disorder. Many rehabilitation facilities offer treatment and support because the problem with Demerol addiction is going up. Users can choose between outpatient and inpatient rehabs. Doctors recommend residential centers, especially during the detox phase. In addition, some centers provide substitute drugs because the patient might need help in case of severe withdrawal. In addition, massages, yoga, and art therapy are alternative methods. They are there to help the patients enjoy the fun activities in their everyday life. Recently, many centers provide individual treatment plans and luxury facilities. As a result, one can really enjoy their recovery process in the case where money is not a problem. In case you’ve noticed them in your loved ones, do not hesitate to seek help.